Welcome to the home of Sebastian and Lucie Snook — Snooks’ Cove. 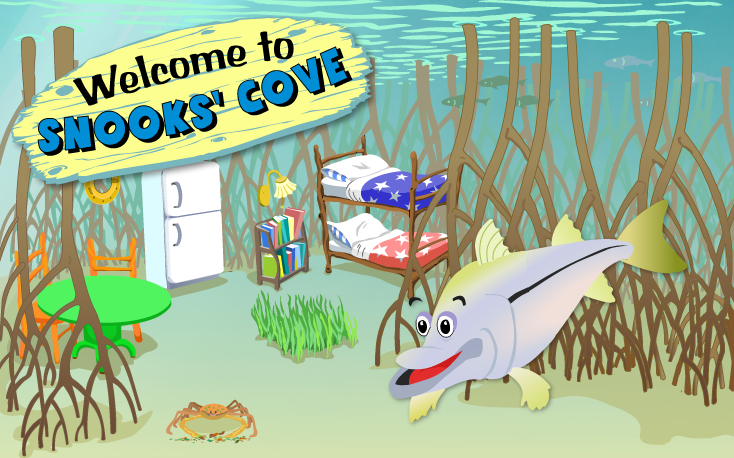 Lucie and her brother Sebastian invite you to explore their home among the mangrove roots to learn about the things that make the Indian River Lagoon a very special place. Click on an icon above to learn more about these two snooks, their lagoon and its habitat. Hi! I’m Sebastian Snook and I live in the Indian River Lagoon, one of the most unique places in the United States. My lagoon is home to lots and lots of different kinds of animals and plants — more than 4,300 in all — including more than 2,000 species of plants, 600 species of fishes and 300 species of birds. 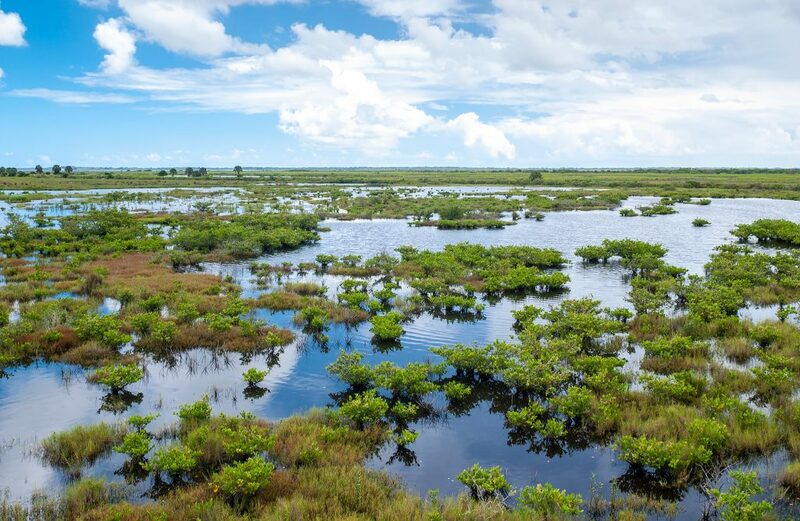 Scientists call places where many different species live “biologically diverse,” so I guess you could say that the lagoon is one of the most biologically diverse places in the United States; and that’s pretty special! All lagoons are shallow bodies of water separated from the ocean by a series of barrier islands. Inlets, either natural or made by people, cut through barrier islands and allow tidal currents to transport water into and out of lagoons. Rivers and streams also empty into lagoons, so the water in a lagoon is brackish, a mix of salt water from the ocean and freshwater from rivers and streams. If you think all fish look similar, let me tell you that we snook stand out from the crowd. I’m a large, sleek, powerful fish, like a sports car with fins, at least I will be when I’m older. My body is a shiny silvery color, but the top of my head and along my back get greenish and darker. My fins are bright yellow in color. My lower jaw sticks out like a shovel, and I have a long black racing stripe on my side that runs from my gills to my tail. OK, it’s really called a lateral line, and it helps me to sense things in my environment, but to me, it’s a racing stripe! Once you see my stripe and my funny-looking jaw, you won’t likely mistake me for any other fish. We snook are distinctive, just like the lagoon! When I was smaller, I used to like to spend time in quiet rivers and creeks protected by overhanging vegetation. I also spent time near rocks or pilings that provided cover. These calm, shady areas sheltered me and helped me capture dinner. Now that I’m older, I like to spend more time in saltier water, especially during the summer months. Seagrasses and mangroves in the lagoon are an ideal place for me to grow up and get strong. There’s always plenty to eat in the seagrass, and the roots of mangrove trees help protect me from bigger fishes that might try to eat me. For me to grow up big and strong, it takes a lot of food, and I’m not a picky eater. Fortunately, the Indian River Lagoon is like one big grocery store for me. Pinfish, bay anchovies, mullet, mosquitofish, pigfish shrimp and other small crustaceans are among my favorite foods. I will catch food all day long when the opportunity arises, but I really concentrate on feeding about two hours right before sunrise (the early snook gets the shrimp, after all) and a few hours after sunset. If you’re thinking that I must grow up to be one of the biggest fish found in the lagoon, you’d be absolutely right. My hearty appetite allows me to grow more than four feet long and weigh as much as 50 pounds. However, it’s going to take me a few more years before I get that big. When I do get big, one thing I’ll have to watch out for are anglers — people who like to go fishing for fun or recreation. Anglers consider us snook “game fish,” that is, big, strong fish that put up a good fight to not get caught on their fishing lines. Game fish like me are one of the biggest challenges to people who fish in the lagoon, so we tend to attract lots of anglers to the lagoon each year. Back in the 1950s, the problem of too many people trying to catch us caused our family to be nearly wiped out in Florida’s waters. Commercial fishermen and anglers took too many of us, and lots of our crucial mangrove and salt marsh habitat was lost to human development. Fortunately, the government of Florida stepped in and banned commercial fishing for snook throughout the whole state. That meant that snook could no longer be bought in markets or sold in restaurants. As you might imagine, that took a lot of the pressure off our population and allowed our stocks to replenish. Other rules were put in place for recreational anglers that limited the size and number of snook that could be legally taken. Scientists say that these rules have helped our population numbers to rebound, which means there are a lot more of us around today. Phew! That’s good news for me! Well, I hope you learned a little about me and my lagoon. Of course, it’s your lagoon too, so treat it gently when you come to visit and be careful not to pollute it. My friends and I would sure appreciate that! Here’s a riddle for you, what kind of grass doesn’t need to be mowed? Gently swaying below the water’s surface, thousands of acres of seagrasses provide food and shelter for many of my friends and neighbors and are one of the Indian River Lagoon’s most important habitats. 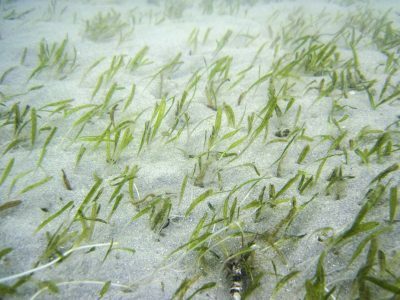 Some creatures, like manatees, think that seagrasses are a pretty tasty meal and graze on seagrasses just like cows on land graze on grass…. I wonder if that’s why people call them sea cows? 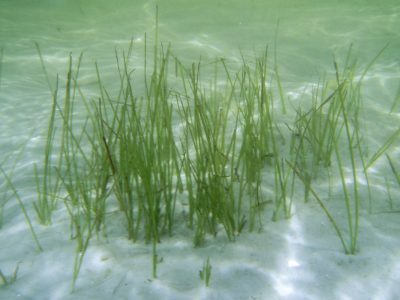 Like grass on land, seagrasses need plenty of sunlight and good water quality to grow. 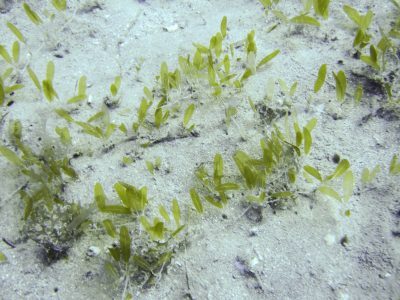 Sometimes nature can affect the growth of seagrasses. 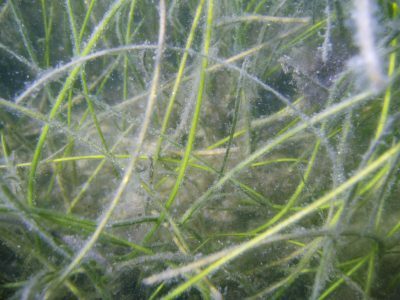 Cold weather in winter causes seagrass beds to die off until the warm weather returns in early spring. Hurricanes and severe storms can also churn the lagoon like a washing machine and scour seagrass from the sandy bottom. When this happens, it can take seagrass beds a long time to recover. Pollution entering the lagoon can block sunlight and prevent seagrasses from growing. Most pollution enters the lagoon as runoff from the land. This happens after rainstorms, when dirt, debris, oils, pet wastes and even garbage are carried in rain to storm drains that flow directly into my home. Runoff clouds the water, blocking sunlight from reaching seagrass blades and smothering seagrasses with dirt and silt. That’s bad for all of us who depend on seagrasses for food and shelter. You can help protect my lagoon home. Please make sure that you and your parents don’t dump oils, pet wastes, paint or chemicals down the storm drain. Remember, let only rain down the storm drain! When helping with chores around the house, use outdoor chemicals properly. When fertilizers or pesticides fall on your driveway or on the street, be sure to sweep them back onto the lawn to prevent them from running off into the lagoon where they could cause nasty algal blooms and steal the oxygen from the water that my friends and I need to breathe. 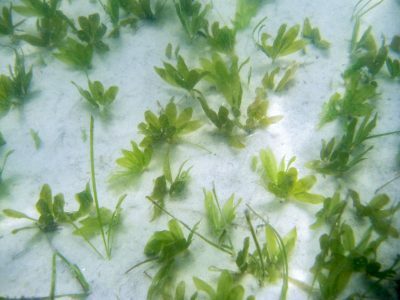 Did you know that there are seven species of seagrass found in the lagoon? Scientists give every species a unique Latin name, which is the formal name for that species. Most people find it easier to just use a nickname based on how the species looks, how it lives, or by some other characteristic. 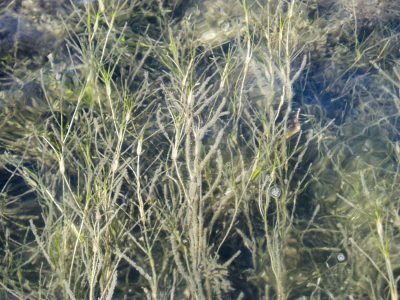 Florida’s seven seagrass species each have nicknames that are simple to remember. When you visit the lagoon, please respect the seagrass. It is so very important to all of us who live here. 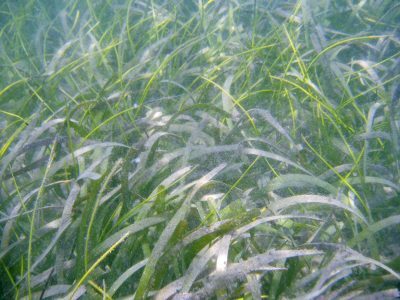 Remember, seagrasses are one of the most important habitats in the lagoon. They are important nursery areas for baby fishes, they provide food and protection from predators, and they need your help to stay healthy. Hello! I’m Lucie, Sebastian Snook’s sister. You have probably noticed that our comfy little nook is a home in the mangroves. Many of my neighbors also spend time in the mangroves because the intricate root systems of mangroves provides great places to escape from predators. 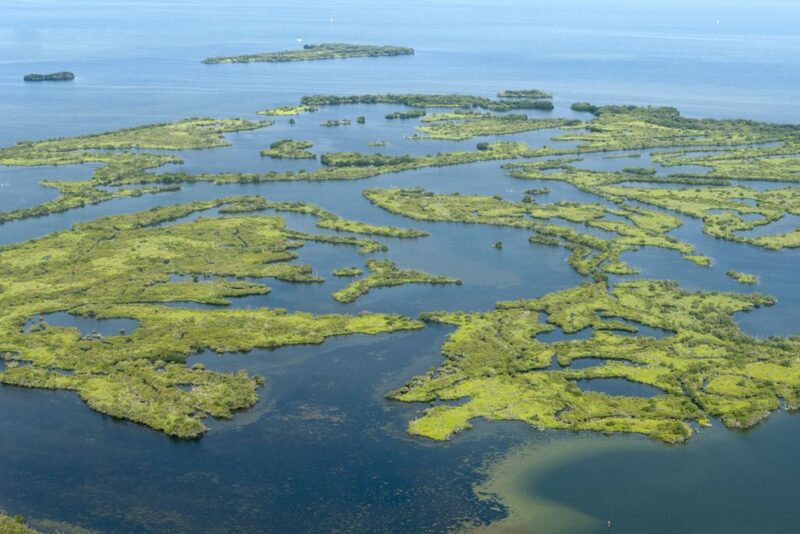 Though mangroves can grow in freshwater, they avoid having to compete with other plants for light and space by growing where most other plants can’t grow: in the brackish (somewhat salty) water of estuaries like the Indian River Lagoon. Because mangroves grow right at the water’s edge, their roots are wet or under water most of the time. That makes them great habitat (living area) for species like barnacles, mussels and oysters that have to live attached to a surface. For creatures that can move around, mangrove roots are excellent feeding and sheltering areas where young fish like me can find plenty of food and a hiding place from bigger fish, crabs and birds that could try to eat me. In areas of the Indian River Lagoon where there are many mangroves, you will find all kinds of creatures living the good life. You may not realize it, but mangrove leaves are an important part of the food web here in the lagoon. The mangrove tree crab (Aratus pisonii) eats the leaves of the red mangrove right off the tree, but most other species have to wait until the leaves fall. When leaves fall from the trees, fungi and bacteria decompose the leaves and turn them into “detritus.” Detritus forms the base of the food web in the lagoon, and many species such as crabs, shrimps, oysters, clams, anchovies and mullet depend on detritus for food. These creatures are preyed upon by larger crabs, birds and big fish like snook, seatrout, red drum and tarpon. Sharks, dolphins and alligators then eat the bigger fish. Let’s not forget you humans. You are part of the food web too when you eat crabs, shrimp and fish. 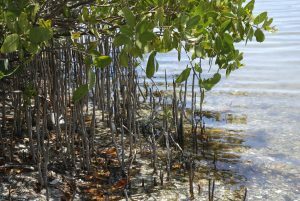 In Florida, mangroves are protected and there are rules that prevent people from cutting them down or removing them. That’s a good thing. Why? The thick tangles of mangrove trees and their roots help protect the coasts from wave and wind damage during hurricanes and tropical storms. Mangrove roots also slow down the flow of tidal water so that sediments in the water sink to the bottom. So in a way, mangroves use the sediments they trap to build their own environment! 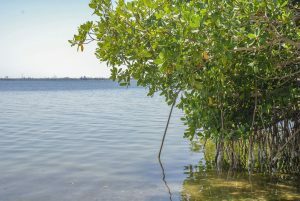 You can find three kinds of mangroves in the Indian River Lagoon. The red mangrove is known as the “walking tree” because its prop roots look like legs walking in the water. The roots of this tree actually grow from the trunk and branches of the tree down into the water. This mangrove has reddish bark on the trunk and has the largest, shiniest leaves of all the Florida mangrove species. The leaf color is dark green on the top, but lighter green on the underside. The red mangrove flowers nearly all year long and produces unique string bean-shaped fruits called propagules that grow into seedlings while still attached to the parent tree. When they are ready to grow on their own, propagules drop off into the water where they either take root in the ground or float and drift for as long as a year until they find a suitable place to grow. The black mangrove is usually found at higher elevations than red mangrove. The base of a black mangrove is surrounded by pneumatophores (pronounced “new-mat-afores”), finger-like twigs that grow straight up out of the ground. Pneumatophores are a kind of air root, which extend above the high water line and help the trees to breathe by moving air into the roots. The bark of the black mangrove is dark and its leaves are narrow and pointed at the tips. Leaf color is a shiny dark green on top and silvery green on the underside. The propagules are light green in color and shaped like lima beans. 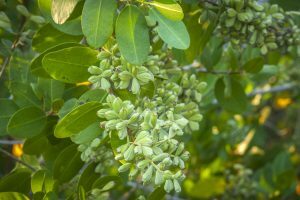 Black mangroves have one other interesting trait: the leaves of a black mangrove nearly always have white crusts on them, especially on the backs of the leaves. Want to guess what these crusts are? They’re salt! Go ahead and taste it for yourself if you like. You see, black mangroves take in salt water, but they don’t use the salt, so it gets released through the leaves. 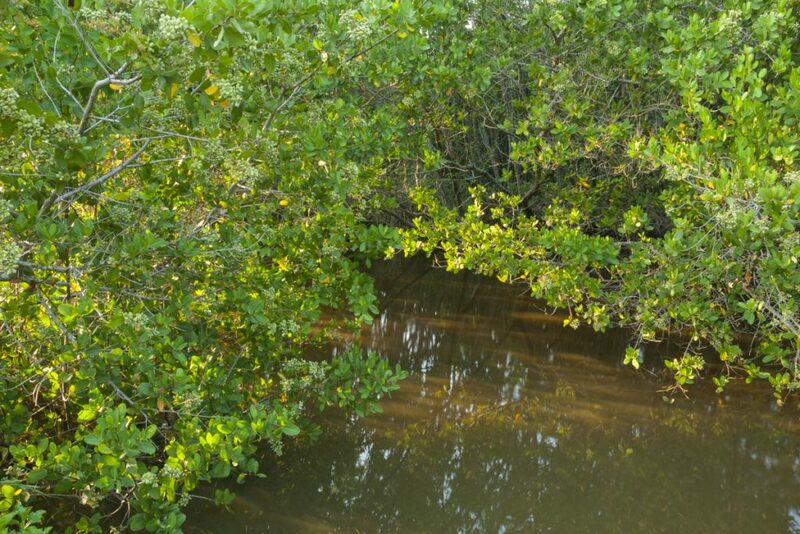 The white mangrove is usually found at higher elevations than either red or black mangroves. You can identify the white mangrove by its light green leaves, which are the most rounded of the Florida mangroves. Leaves have a small notch at the tip and two tiny glands at the leaf base. These glands release both salt and nectar, which encourages insects like ants or bees to come visit the tree. The almond-shaped propagules of a white mangrove are about the size of a nickel and whitish in color. As you can see, mangroves are very special trees. They thrive under salty conditions that would kill many other plants, and because they live right along the shoreline, their roots provide habitat for lots of lagoon animals like me and my friends. The next time you see mangroves in the lagoon, take a minute to check out all the creatures that live on mangrove roots and feed under the protection that mangroves provide. Remember there is much more happening here than meets the eye. Do you like seafood? 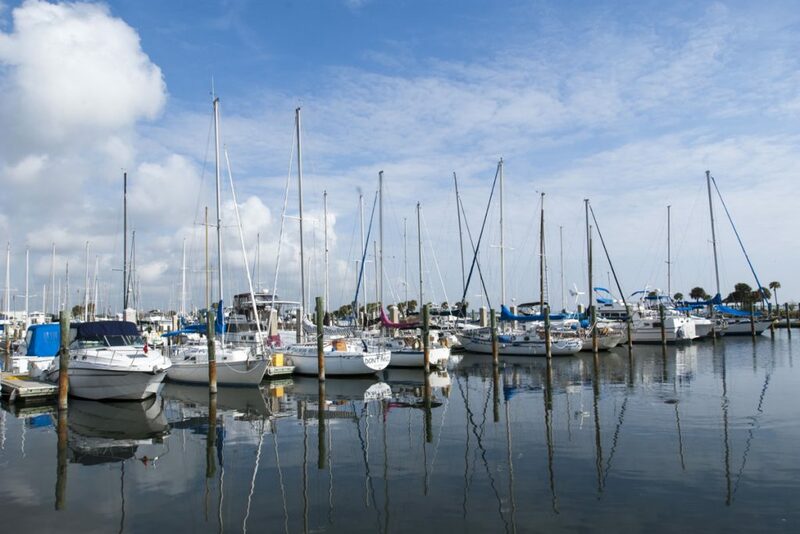 If so, try to imagine that the Indian River Lagoon is a huge seafood market, offering all kinds of delicious fish, crabs, shrimps, clams and oysters. Humans have always depended on the lagoon for food, but humans can impact the lagoon in ways that can harm the food sources they prize. Consider the humble oyster, a tasty shellfish that lives on the bottom of the lagoon. Oysters can be cooked several different ways and can even be eaten raw. We snook don’t like them, but I hear that people find them tasty. Beside making a good meal, oysters play an important role in keeping the lagoon clean and healthy. Oysters are filter-feeders: they draw water in over their gills through the beating of tiny, hair-like cilia (pronounced silly-ah). One adult oyster can filter about three gallons of water every hour, screening out tiny plankton and suspended particles that provide the oyster with food. Food gets trapped in the mucus on the gills, and is transported to the mouth, where it is eaten and digested. Think about how much water all the oysters in the lagoon can filter every hour. That’s a lot of cleaning up! The oyster’s greatest predators include crabs, sea birds, some types of snails and humans. At one time, oysters were plentiful in the lagoon. There were so many that Native Americans who lived near the lagoon would eat them by the thousands and pile the empty shells so high that they looked like hills. These garbage mounds are called shell middens and several of them can still be visited today. Times have changed. Pollution, overharvesting and the damaging waves caused by boat traffic have reduced the number of oysters in the lagoon significantly. But there is good news. Many volunteer groups, agencies, universities and others are leading projects to help save the oysters and rebuild oyster reefs throughout the Indian River Lagoon. Children and adults are helping to make special mats that serve as the building blocks for new oyster reefs. Oyster shells are drilled and then attached to each mat. As the mats are finished, they are joined together and weighted down to help hold them in place. They are then placed over dead areas in oyster reefs to encourage new oysters to move in and settle down. Scientists have learned that oyster shells release a chemical signal that tells floating oyster larvae where it’s safe to land and grow. The mats help to increase oyster growth and, over time, will help to rebuild many of the oyster reefs that have been lost. As new oyster reefs become established, other wildlife that depend on the reefs to survive will also return to repopulate damaged areas. 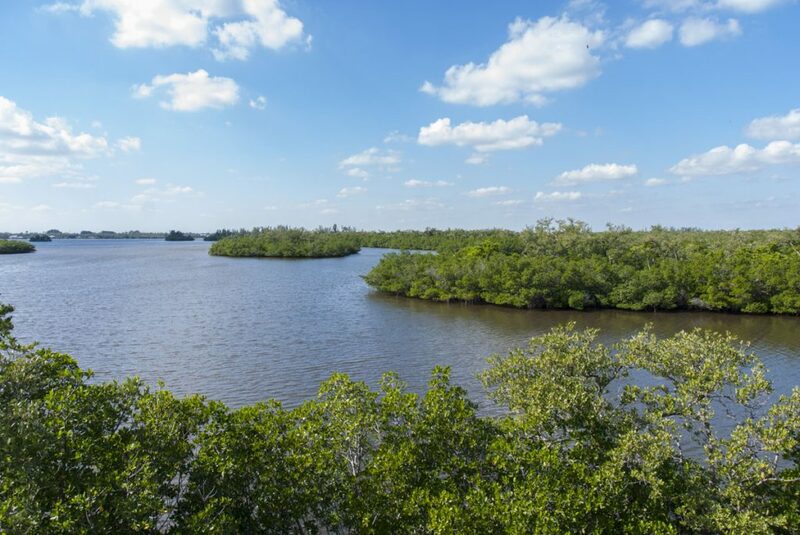 The Indian River Lagoon is a special waterway along Florida’s east coast, full of interesting plants, animals and man-made places. Check out these pictures of my home. 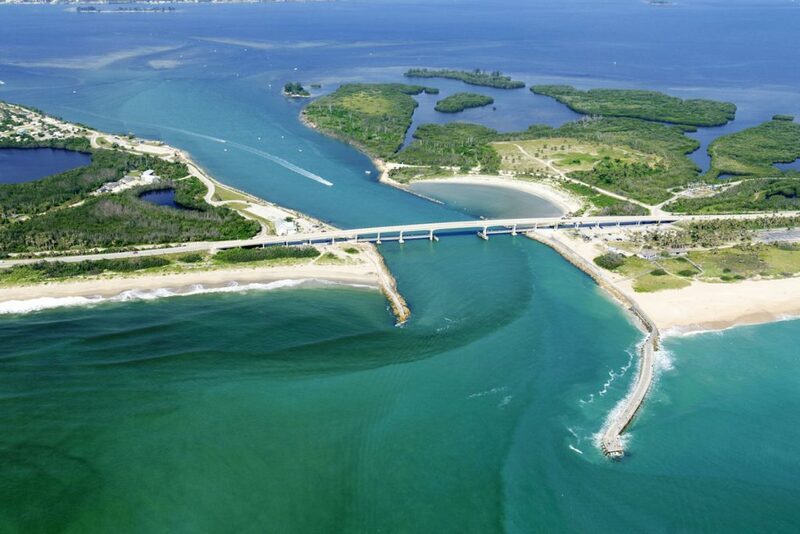 Sebastian Inlet is one of five inlets that connect the Indian River Lagoon with the Atlantic Ocean. This bird forages mostly by standing still or stalking very slowly at the edge of shallow water. It sometimes drops bait such as a feather or small twig on the water’s surface to lure fish, making it one of the few known species to use such tools. 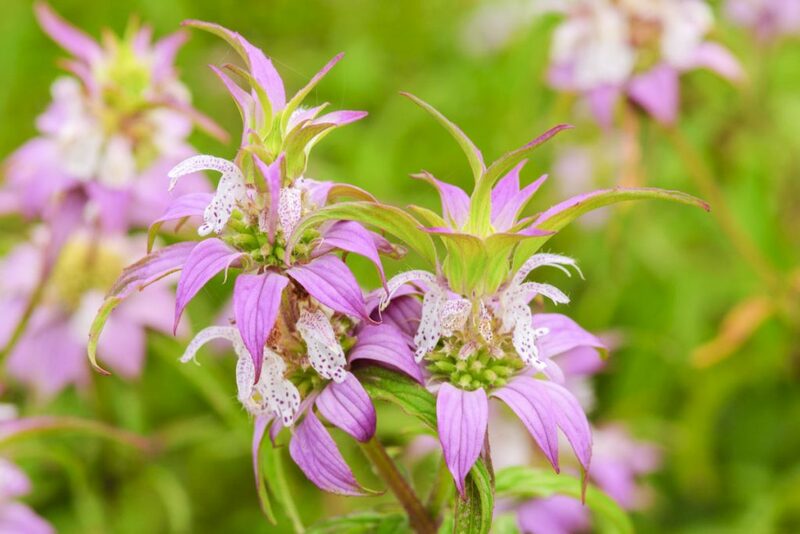 Dotted horsemint is a pretty flower you might see at Merritt Island National Wildlife Refuge. 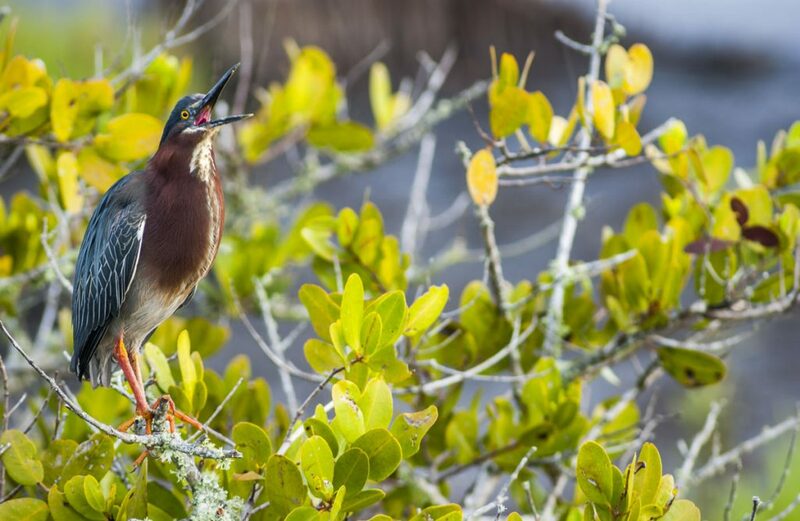 Take the drive along Black Point Wildlife Drive at Merritt Island National Wildlife Refuge to see a variety of animals that live in the lagoon region. 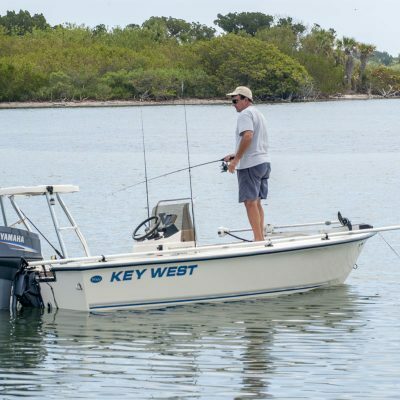 Hiking, bicycling, fishing and boating are among activities you can enjoy along Blind Creek in St. Lucie County. 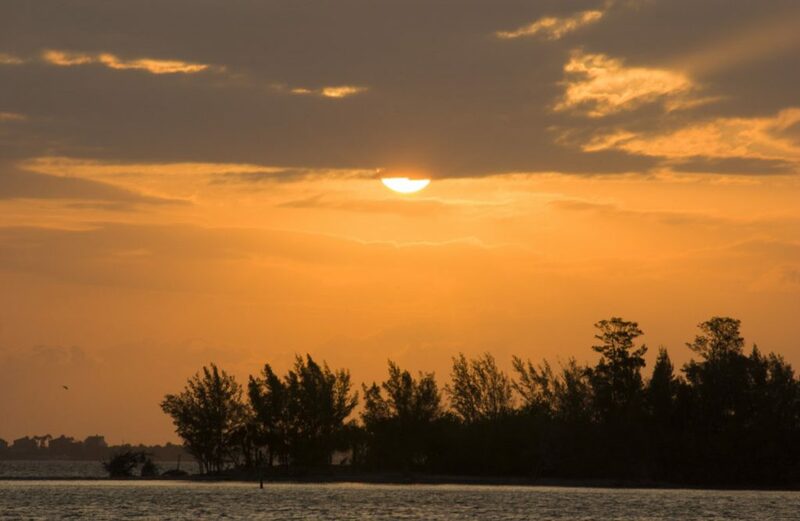 The sun’s bright orange glow welcomes a new morning over the Indian River Lagoon. Boating is one of the most popular activities on the lagoon. 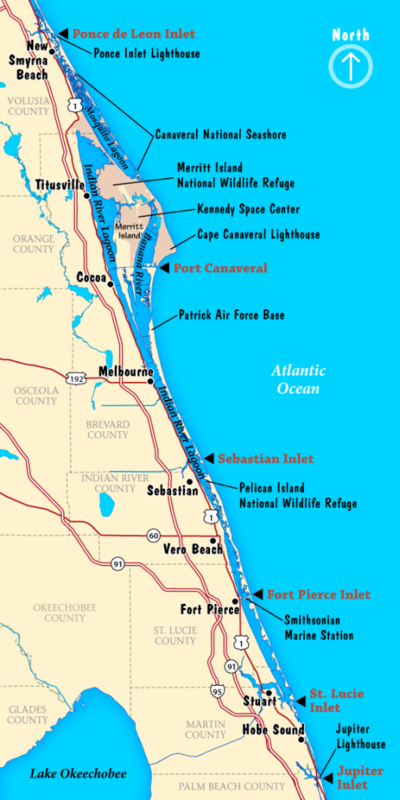 The Indian River Lagoon stretches along five counties on Florida’s east coast. The region is a special place full of natural and cultural resources, as well as modern wonders. Enjoy your bird’s eye tour of the lagoon.